The International Baby Food Action Network (IBFAN) is structured like a net. It encompasses the Earth. All IBFAN groups work to ensure baby foods are marketed responsibly. This film tells you more about IBFAN's work. IBFAN groups are diverse: they may work on infant feeding issues alone, or they may be mother support groups, consumer associations, development organisations or citizens rights groups. Some are staffed by volunteers, some have full time staff. What all groups have in common is they take Action to bring about implementation of the International Code and the subsequent, relevant Resolutions of the World Health Assembly. These are the main tools that IBFAN uses with the aim of ensuring that the marketing of baby food does not have a negative impact on health. The DVD is provided in a CD-style case. Running time just over 7 minutes. 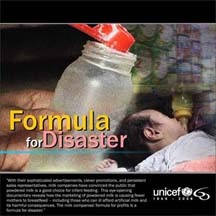 £10.00 of the cost of the DVD is to cover Baby Milk Action's time and costs in preparing a copy for you. £10.00 is a donation to go to IBFAN's international work. Feel free to add an additional donation! Additional shipping for international orders will be calculated at the checkout based on your total order. "This eye-opening documentary reveals how the marketing of powdered milk has caused fewer mothers to breastfeed in the Philippines - including those who can ill afford artificial milk and suffer its harmful consequences. The milk companies' formula for profits is a formula for disaster." You can view this film on-line by clicking here. The DVD is provided in a CD-style case. Running time approximately 30 minutes. Dr. Jack Newman’s Visual Guide to breastfeeding helps you to understand how breastfeeding really works and lets you cut through all the confusing and contradictory information out there on breastfeeding. It is easy to understand and will be helpful for both new parents and for health professionals. Many of us do not have a notion of what a baby looks like on the breast. This video is designed to make the breastfeeding experience a success and pleasure for mothers and babies. In it, Jack Newman and Edith Kernerman answer a wide variety of questions, from how to ensure that a baby is getting milk to helping overcome some of the most common problems associated with breastfeeding. Each of these ‘chapters’ can be viewed separately directly from a menu. £2.00 will be added for delivery outside the UK. A highly recommended film from Norway (in English) - essential viewing for health workers and breastfeeding mothers. 35 minutes. Available as DVD or VHS video tape in various formats. Please specify. Available in other languages - contact us for details. Note: you can watch the launch of Breaking the Rules, Stretching the Rules 2010 by clicking here. The monitoring report Breaking the Rules, Stretching the Rules 2004 was launched at the House of Commons on 13 May 2004. IBFAN experts from Malaysia, Thailand, Argentina, Brazil and the UK presented evidence of company malpractice at a meeting hosted by Dr. Lynne Jones MP. See the evidence for yourself in this 45 minute film. As a bonus, there is a 15 minute film of the demonstration that took place at Nestlé (UK) HQ on 15 May 2004. Available as a DVD or video in UK format (PAL). This is a film of a debate between Baby Milk Action's Campaigns Coordinator, Mike Brady, and Nestlé's Head of Corporate Affairs, Hilary Parsons, and Senior Policy Advisor, Beverly Mirando. The debate took place at Cardinal Newman School, Brighton, in March 2003. Students had Nestlé vending machines removed from the school following the debate. The video is not of professional quality, but it is useful to see directly the dishonest way in which Nestlé attempts to undermine the boycott. The debate is given in its entirety, without any editing. The video is availableas a VHS video (PAL format for UK) or a DVD. It may be borrowed for a handling charge of £10.00 in the UK. An additional £2.00 will be added for delivery outside the UK.